So You Think Obama had it Tough, huh? What a Whiner! As the 2012 election draws near a recurring theme from supporters of President Obama is things may be bad but they were made bad by President Bush four years ago and they were so bad that our current President hasn’t had time enough to fix all the problems. What a krok! What a load of BS! Never in my life have I heard such a whiner who is supposed to be a leader and I am utterly amazed Democrats don’t hang their head in shame every time their leader or his surrogates speaks on this subject. If you think Obama had it tough, just think about the circumstances other Presidents inherited and how they responded. 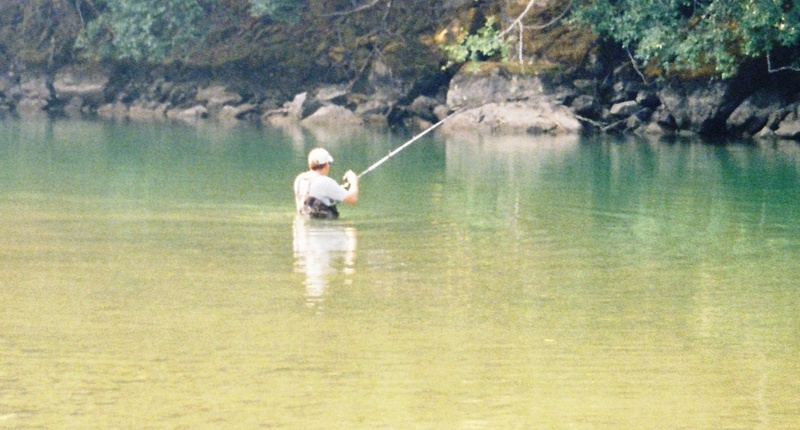 The closest in terms of time and circumstances was President Ronald Reagan. Do you remember how bad things were in 1981? The U.S. was in the worst recession since the Great Depression, many aspects of which were much worse than the circumstances of the past four years. The unemployment rate was at 7.5% when Reagan came into office in January 1981 on its way to a post-war record high of 10.8% in December 1982. Average mortgage interest rates were over 13% and on their way to a high of 15.8% in November 1981. 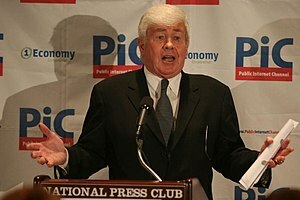 Rates were THAT high in order to combat the staggering inflation Jimmy Carter’s administration had failed to control: In 1980 it was 13.58%, 10.35% in 1981, and 6.16 in 1982. To put that in perspective only one year in the 30 years since has inflation crawled over 5%. On top of the terrible economic news Reagan inherited a world where the threat of nuclear war was real. 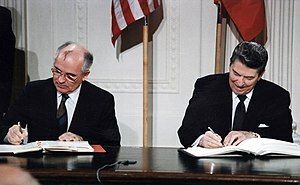 President Reagan and General Secretary Gorbachev signing the INF Treaty in the East Room of the White House. Français : Ronald Reagan et Mikhaïl Gorbatchev signant le Traité sur les forces nucléaires à portée intermédiaire dans la salle Est de la Maison Blanche. The Soviet Union was occupying Afghanistan and still posing an ominous presence in Eastern Europe. OPEC was still only a few years old, we were only a few years from having lost the Vietnam War, and Iran had just emerged as a new and real enemy having only released the American hostages on the day Reagan took office. So you think Obama had it tough? Under Ronald Reagan by 1984 unemployment was down to 7.2% on its way to 5.3% at the end of Reagan’s term. Inflation was only 3.22% in 1983, 4.3% in 1984. 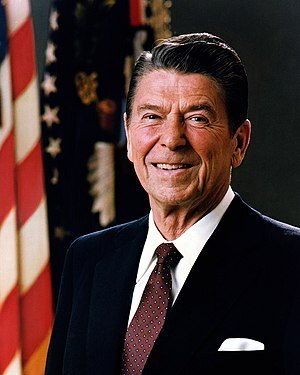 The Soviet Union threat had been largely diminished and Reagan was soon to meet and begin peace negotiations with their leader Mikhail Gorbachev. And while those negotiations failed, so did the Soviet Union, driven into the ash heap of history thanks in large part to Reagan’s tough stance with them. George W. Bush inherited the dot-com bust and recession and 9 months into office faced the tragedy of 9-11; a plot hatched and put into action long before he became President. Richard Nixon inherited a war, the Vietnam War, and ended it. He also stepped into the most divided nation socially and politically than at any time since the Civil War. 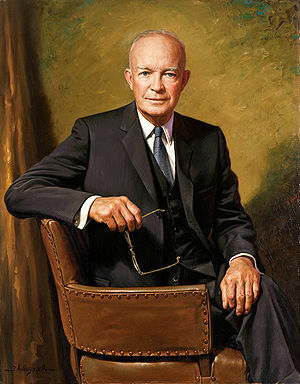 Dwight D. Eisenhower, official portrait as President. Dwight D. Eisenhower inherited a war, the Korean War, and ended it. Also, 6 months into office Eisenhower had his own Recession to deal with. The Recession of 1953 lasted 10 months and saw the nations Gross-Domestic-Product fall to -2.6% at its worst. There have been approximately 47 recessions in the United States since 1790. The most recent one may have been one of the worst. But so what. According to economists our current recovery is the slowest in U.S. history. George Washington not only inherited a Presidency following a war, he inherited a presidency with no precedent. He was the first. He also ruled a country that as yet had no Bill of Rights, or Supreme Court. and the Iraq and Afghanistan Wars. Never in my lifetime have I heard a supposed leader continually blame his predecessor to the degree President Obama and his supporters have blamed George Bush. And what saddens me is that they are teaching our country’s young people this is how it is supposed to be. I reject that idea. America has been made by fine statesmen and leaders who didn’t whine about their circumstances, they worked to make them better. 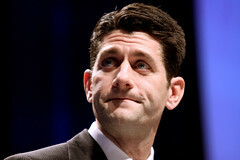 I pray this November Americans decide the whining has to stop and elect Mitt Romney to at least act like a leader. 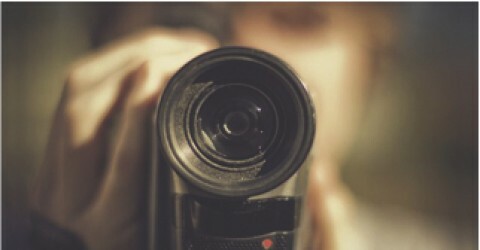 Call for affordable video production. Categories: National Politics . Tags: barackobama, George W. Bush, Jimmy Carter, Mitt Romney, Obama, Reagan, Republican Party, Republican Presidential Candidates, Ronald Reagan, Soviet Union, United States . Author: Michael Schuett . Comments: Comments Off on So You Think Obama had it Tough, huh? What a Whiner!